Following its acquisition of IBM's computing division, Lenovo has launched its own branded laptops. 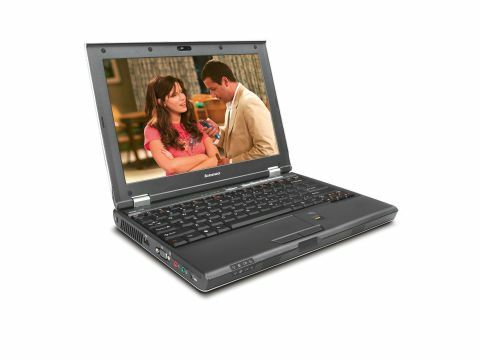 The Lenovo 3000-V100 (£1010 inc. VAT) combines both Lenovo and IBM designs into a reliable and portable consumer laptop. An ultraportable machine, the chassis weighs just 1.8kg, with a footprint of 302 x 220 x 36mm. However, this is flawed by a poor battery life. Running for 129 minutes under test conditions, there's not nearly enough power for extended mobile use. No such problems hinder usability. Using the celebrated keyboard of the IBM ThinkPad range, typing is a pleasure, thanks to responsive keys and a smooth typing action. The touchpad is a bit too small for optimum control, but this is expected due to the small chassis size. Equally impressive is the 12.1-inch Super-TFT screen. Despite a standard 1280 x 800 pixel resolution, images are bright, colourful and sharp. Its widescreen aspect ratio is ideal for office and DVD use, marking it out as one of the best we've seen on such a small laptop. Although powered by an Intel Core Duo T2300E processor, performance fell far below what we expect from a dual-core chip. Even with 512MB of DDR2 memory and a 5400rpm hard drive, a MobileMark score of 171 points proved less powerful than even Intel's old Pentium M processors. However, this will still be fine for basic home and office tasks. Obviously 3D performance is equally low, considering the ultraportable chassis. Using integrated Intel 945GM graphics, high-powered gaming won't be possible, but the Lenovo is still great for viewing DVDs and multimedia presentations. This is helped by the inclusion of a built-in optical drive; an unusual addition for an ultraportable. Allowing users to play DVDs and CDs, the drive even supports dual-layer recordable discs, making it perfect for backing up large amounts of data. A useful addition for business users is the addition of a fingerprint reader, which adds a biometric layer of defence. For Internet use, taking photos and even network conferencing, a 1.3-megapixel camera sits above the screen. With such an impressive set of components, it's unusual to note that networking options aren't as extensive as expected. High speed 802.11 Wi-Fi connectivity is provided by an Intel PRO/ Wireless 3945ABG, but Ethernet speeds are limited to 10/100 Base-T.